Despite a typically wet and windy February weekend in Manchester, Lama Jampa Thaye’s teaching of the second part of ‘Rays of the Stainless Vajra Moon’ was an uplifting experience. Over 120 people from as far away as Mexico and the US gathered for two days at The Studio in the city’s fashionable Northern Quarter to learn and meditate together. This text was composed by Jamgon Kongtrul Lodro Thaye, one of the greatest Tibetan masters of the last 200 years. It provides a practical guide to meditation on the reality of existence – going beyond ‘sitting meditation’ which is commonly used to achieve a settled and flexible mind. Only once we have achieved this degree of calm can we go on to explore the naturally pure reality of our mind and can radically transform our lives in the way Jamgon Kongtrol describes. 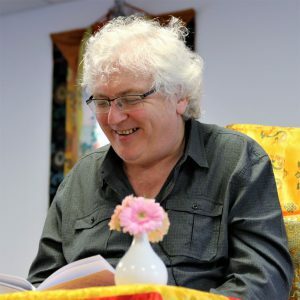 Lama Jampa Thaye interspersed his teaching with sessions of meditation and Q&A to help ensure people were clear about how to do the practice. The third and final part of this Buddhist teaching will take place on 1 and 2 July 2017. Further details will be published nearer the time. For more information about Lama Jampa’s national and international teaching programme visit his own site.